You are here: Home / Outdoors / Hunting / Fixed vs Variable Scope: Which Is Best For Hunters? As a hunter, you already know how important the right equipment is to your overall success. Whether it’s your rifle, your tree stand, bench or your tripod, if everything is not working in top notch, perfect order it can be very detrimental to your hunting day. The same logic holds true for your hunting scope. 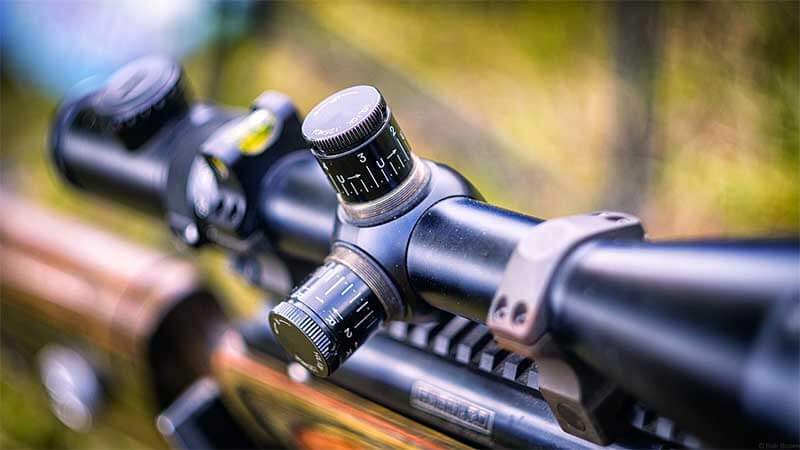 While some hunters prefer the simple design and single magnification of a fixed scope, others prefer to use a variable scope that allows the hunter to vary the magnification from different points in the field. To help you make a decision regarding your next scope, in the following article we will discuss and describe both the fixed and variable scope in some detail as we explore the question: Which scope is better for hunters—fixed or variable. There can really be no argument that magnified optics (scopes) offer a distinct advantage for hunters in the field. Not only do scopes greatly simplify the aiming process when hunting for a wide variety of game, they also allow for greater accuracy when spotting up and killing prey. The magnification provided by these rifle-top scopes also allows for greater precision when taking the shot, ensuring you will strike the animal in the so-called kill zone (near the heart and other major organs) for the most ethical takedown possible. Without these scopes, hunters would need to do a lot more tracking after striking their prey, largely because the chance of hitting one of the major organs will decrease dramatically. The increased capability provided by scopes does not come without its disadvantages and sacrifices. First, scopes can vastly increase the weight of your rifle, making for a much more draining hunting session. There is also a chance that your scope can “come off zero” in the field or even break, making it nothing more than an extra weight atop your gun. Scopes and the technology behind them have evolved over the years, making the above-mentioned drawbacks less of a problem. However, the age-old argument of which type of scope is better for hunting, a fixed scope or variable scope, rages on. Although both the fixed scope and variable scope are definitely here to stay, each of these types comes with its own set of advantages and drawbacks when it comes to hunting in the field—advantages and drawbacks that deserve be noted. To help illuminate the rewards and downsides of both the fixed and variable scope—and to help you decide which one you should use for hunting in the field—below we have highlighted each of these kinds of optics and provided some quick tips and tricks to help you decide. As their name suggests, fixed or “fixed-power” scopes have no adjustment in the amount of magnification they offer. Because of this, fixed scopes are usually lighter in weight than their variable counterparts and much less complex in terms of the amount of time and knowledge it takes to learn them. Fixed scopes also tend to be more affordable and much more compact. Easy to operate, a fixed power scope usually has little more than adjustable turrets to sight in the scope and the main body. This design feature makes them much more streamlined than variable scopes and easier to carry. They are also fairly easy to adjust and use. Because the fixed power scope almost always has a preset parallax, the eye box of the scope tends to have a much more forgiving window, which makes the scope much faster in terms of acquiring snapshot views. For people that are brand new to the sport of hunting—or simply brand new when it comes to hunting optics—the fixed power scope offers a much easier experience that is designed to help beginners, especially if this is the first time they will use their use their rifle under stressful conditions. For spotting up a target, the fixed power scope makes a lot of sense. Even if you just use it for plinking, the last thing you want to do is adjust and readjust your scope each and every time you pick up your rifle—or your scope. Being that many of today’s fixed power scopes are now incorporating red dot reticles, these types of scopes have the ideal combination of features for a short range, lightweight optic that is made for hunting in thick southern marshes or the deep-green northern forests. Variable scopes are just that: variable. These scopes offer hunters the advantage of being able to tailor and fine-tune the amount of magnification they see when looking through the scope to the shot before them. Keep in mind, though, that range that does not always determine magnification. While some think that the further a target is from them the more magnification they will need, this is actually a common misconception and it is just not true. Although small game hunters may be able to benefit from a higher degree of magnification for long distance shots, it’s important to remember that small game—like squirrels and rabbits—are always going to be small no matter what their range is from the hunter. Naturally, should a target like this present itself from a closer distance, or if an animal much larger than you thought you would be hunting that day presents itself, the ability to vary your magnification will enable you to tailor your scope to that particular shot. On the flip side of the equation, hunting with a variable magnification scope can really complicate your hunting experience. In most cases, these scopes are much more difficult to sight in, they require a lot of parallax adjustment, and they are usually much heavier and awkward atop your rifle. There have been many hunters who have missed out on a perfect shot as they were attempting to sight in their variable scope on a target. If it sounds like we are leaning more toward a fixed scope for hunting it’s because we definitely are. In most hunting scenarios, a fixed scope is all you need to bag your prey, and if you are a beginner hunter just learning your craft it definitely makes no sense to start out with a variable magnification scope. In almost all cases, the cost of a fixed power scope is going to be less than that of a variable magnification scope. This price difference lies in the fact that fixed scopes are easier to assemble, have fewer working parts and materials and are typically part of a manufacturer’s more basic line of optics. Many mistakenly believe that a lower price means lower quality but this is not always the case. In fact, electing to go with a fixed power scope is a great way to save money on your optics package—money you can then put into a higher quality rifle or ammunition. The size of the scope should always be considered when making a purchase. Fixed power scopes tend to be smaller in both length and height, making for a lower overall profile when added to your rifle. This, of course, may vary depending on the magnification level your fixed scope provides. The type of hunting you will be doing is also a major factor that should be considered when purchasing a scope. For example, if you are hunting small game locally, in an area you are familiar with, a fixed power scope should be all you need to get the job done. However, if you are hunting trophy-sized elk across unfamiliar territory, the capability of a variable scope can come in very handy. Last but not least, you should always consider the weight of the scope you are buying, as the overall weight of your rifle setup will play a huge role when you are out in the field. A lighter rifle will be easier to carry on long extended hunting treks, and fixed scopes are almost always lighter than their variable counterparts. The overall balance and weight of your rifle will affect how quickly you can shoot, and how accurate you will most likely be with your rifle off the bench or rest. Of course, we must also mention that a lighter weight scope, and thus a lighter rifle, is going to cause much less fatigue and muscle soreness while out in the field. This type of fatigue tends to creep up on a hunter after several hours in the field, and can negatively impact that hunter’s ability to shoot when he needs that ability most.